UPDATE vom 17.2.2014: Neu dabei sind St. Vincent, FM Belfast, Wye Oak, La Femme, Käptn Peng, James Hersey, Spring Offensive und Trümmer. This entry was posted in Mannheim, Termin, Tipp on 16. Februar 2014 by Underpop. This entry was posted in Song, Video on 16. Februar 2014 by Underpop. Konzerte in Mannheim im Februar und März 2014 mit The Black Atlantic, I Am Oak, Noston Live, Black Sheep, Alien Anatomy, Hella Donna, The Sensitives, Grieg & Josy, Fabe Vega im Cinema Quadrat im Collini-Center und in den Kulturbrücken im Jungbusch in der Böckstraße 21. This entry was posted in Fotos, Mannheim, Termin on 14. Februar 2014 by Underpop. This entry was posted in Mannheim, Tipp on 9. Februar 2014 by Underpop. This entry was posted in Song, Video on 9. Februar 2014 by Underpop. This entry was posted in Song, Stream, Video on 9. Februar 2014 by Underpop. This entry was posted in Song, Video on 8. Februar 2014 by Underpop. This entry was posted in Song, Video on 5. 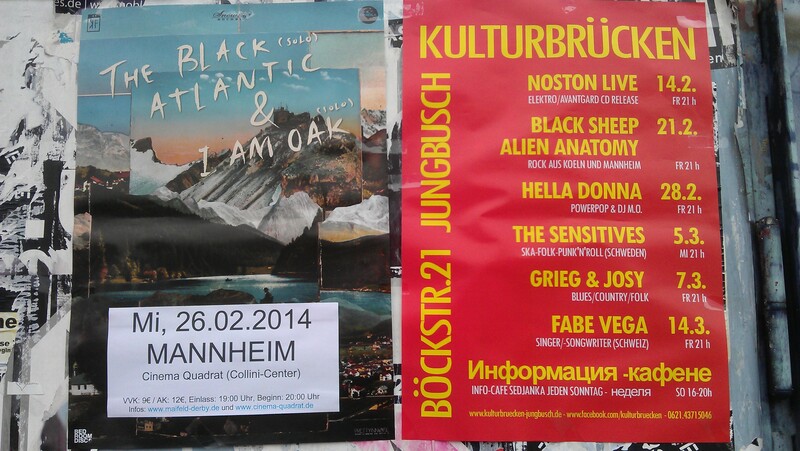 Februar 2014 by Underpop.